Even though St. Patrick’s day is over it doesn’t mean we can’t enjoy a delicious little Irish treat. I was doing some research on traditional Irish dishes, and Boxy seemed like it would work for this post. 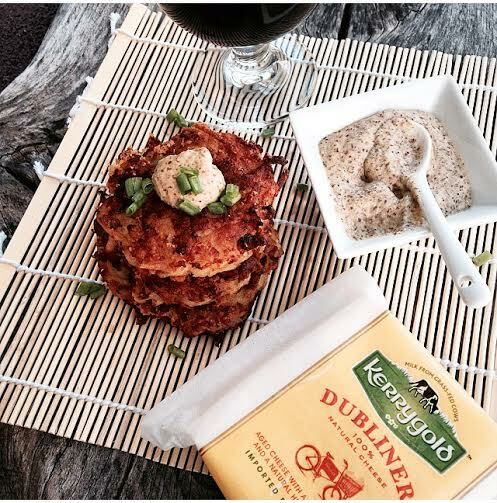 I partnered up with Kerrygold cheese to make this recipe. A traditional Boxy is just potato based, but I went ahead and gave it a little twist adding the Kerrygold dubliner cheese and corned beef. The only problem you will have is keeping your hands off of these; because they taste so amazing. Enjoy them any time of day. In a large bowl take the shredded potatoes, flour, cheese, s & p, and corned beef and toss together. Now take about 1/4 cup of the mixture and form patties. On medium to high heat add canola oil to a skillet. Place the patties gently into hot oil. Don’t over crowd the skillet. Takes about 4 minutes per side or until golden and crispy.